Today's post : Happy 4th of July! If you have the right code, it will then say "You just received 10 Swag Bucks"! 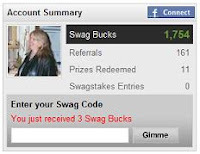 Sign up today of you love free money!